A group of Christian bloggers are planning to have a synchroblog on the Syrian civil war and responses to it on Tuesday 17 September 2013. We invite others to join us in blogging on this topic on that day. A synchroblog is when a group of bloggers decide to post articles on the same topic at about the same time, with links to each other’s posts, so that you can surf through the posts and get a variety of views on the topic. If you would like to see some past examples to see how it works, you can have a look at this synchroblog on Christian reponses to Halloween, or this one on Spiritual warfare or this one on Altered states of consciousness. Some of the links on some of the older ones may not work, because people sometimes close their blogs or move them, but it should be enough to give you an idea of what a synchroblog is and how it works. The Syrian civil war has been going on for more than two years now. It started as protests against the authoritarian dictatorship of Bashar al Assad, which were brutally suppressed, and some of the protesters responded with counter violence. Since then people from other countries have joined in, not all of them with the interests of the Syrian people at heart. 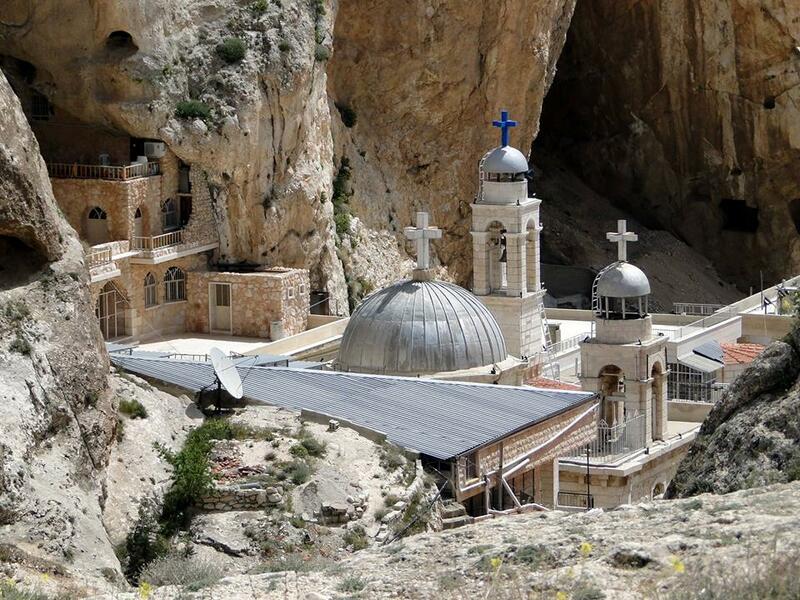 There are now various rebel groups with different interests, and some of them have attacked Christian churches and monasteries, and thousands of people have fled from their homes because of the fighting. Now there is a threat of greater international involvement, as the US government wants to attack the government of Bashar al Assad over its alleged use of poison gas. There is a great deal of ignorance about Syrian Christianity in the USA, the country which wants to bomb Syria. Many Americans seem to believe that Syrian Christians are not Christian at all because they speak Arabic and address God as “Allah”. There are many aspectsw of the conflict, and so many different ways of blogging about it. It would be good is some Syrian Christians could also join in the synchroblog. But because of the threat of the conflict expanding into an international one, we hope that many Christians from many different places will join in. Your blog post can focus on any aspects of it that concern you, from the heritage of Syrian Christians to the fate of refugees. Write your blog post on the Syrian conflict and post it on Tuesday 17 September. I suggest that those in East Asia, Australia and New Zealand post it in the evening, those in west Asia, Europe and Africa post it at midday, and those in America (north & south) post it in the morning. As soon as you have posted, send information about the title & url of your post to me at shayes@dunelm.org.uk using the form below. I will compile a list of the posts as I receive them, and post the links on my contribution, and will also send them to other participants. Post the list of links at the end of your synchroblog post, so that when others have finished reading it, they can go on to one of the others. If you use that format — with the preceding tags in capital letters followed by a single space (resist any temptation to add colons! ), and each piece of information on a separate line (it can word-wrap), I will be able to import it straight into a database without re-typing, and produce a report with the HTML code for the links which can then be appended to your post. I will post them on my contribution, and the easiest thing will be to copy and paste them from there. But I will also send it by e-mail to all the registered contributors (to the e-mail address you provide, so don’t munge it). A new breed of South Africans is emerging, a new subculture, perhaps. It is composed of those who do not merely want to be rich, but who want be filthy, stinking rich; obscenely rich. One of the things that one often hears is that crime is caused by poverty. But that is not strictly true. Criminologists who have researched the matter report that in societies where people are very poor, there is often relatively little crime. What causes the crime rate to rise is the income gap between the rich and the poor. People sometimes like to talk about poverty as the cause of crime. But it is much less common for people to talk about it the other way round — of crime as the cause of poverty. Yet much of the poverty in places like Mamelodi is caused by crime — white crime. Two of the ways in which people achieve their ambition to become filthy stinking rich are politics and crime. Criminologists who have noted that the crime rate increases where the gap between rich and poor increases have also noticed that criminals do not generally rob and steal to feed their starving families. They steal because they want to be filthy stinking rich. Their ill-gotten gains are used for conspicuous consumption. As for politics, we all know about tenderpreneurs. Thabo Mbeki, the former president of the ANC and South Africa, spoke on this phenomenon at the very conference where the ANC voted him out as leader — that unscrupulous businessmen tried to take over ANC branches, and get themselves or their favoured candidates elected at the branches in areas that controlled municipalitries, and used their position to get lucrative contracts and tenders. This is not unique to South Africa, it is found all over the world. There are those who still say that the ANC has not made the mental transition from liberation movement to a political party. But the problerm is the other way round. Those who remember what it was to be a liberation movement are a diminishing minority, and are being swamped by those who see politics as a means of becoming filthy stinking rich. In writing this, I’m not being an investigative journalist. I’m not trying to dig up the dirt on corrupt politicians and businessmen. I haven’t named names nor cited instances of these things in footnotes. I’ve written about perceptions, about gossip, about impressions. And the purpose is not to find and condemn the guilty. Our struggle, as St Paul says, is not against flesh and blood, but against the rulers, the authorities, against spiritual forces of wickedness in the heavenlies (Eph 6:10-12). The problem is not individual sinners, but sin itself. And the problem is not merely individual sins, but rather the inversion of values. Those who desire to be filthy stinking rich do so because of greed. Christians in the past have seen greed and lust as passions that we should seek to control. But there are new ideologies abroad in the world that seek to invert this, and say that passions like greed and lust are good. And so we find people, even people who claim to be Christians, saying that it’s OK to help the poor, but not by taking money from the rich “at gunpoint”. The “at gunpoint” is a peculiar code word among such people for “taxes”. What they mean is that money from taxes paid by the rich should not be used to help the poor. That, they say, is “theft”. And so they invert Christian values; they call evil good and good evil. “See the man,” He says, “and his works: indeed, this also is theft, not to share one’s possessions.” Perhaps this statement seems surprising to you, but do not be surprised. I shall bring you testimony from the divine Scriptures, saying that not only the theft of others’ goods but the failure to share one’s own goods with others is theft and swindle and defraudation. What is this testimony? Accusing the Jews by the prophet, God says, “The earth has brought forth her increase, and you have not brought forth your tithes; but the theft of the poor is in your houses.” Since you have not given the accustomed offerings, he says, you have stolen the goods of the poor. He says this to show the rich that they hold the goods of the poor even if they have inherited them from their fathers or no matter how they have gathered their wealth. And elsewhere the Scripture says, “Deprive not the poor of his living.” To deprive is to take what belongs to another, for it is called deprivation when we take and keep what belongs to others. Thus if the government uses the taxes paid by the rich to provide basic necessities for the poor, such as housing or health services, it is not theft, but rather the recovery of stolen property. To call taxes used in such a way “theft” is to invert Christian values, and to call good evil and evil good. Adulterers may repent. Thieves may repent. Murderers may repent. And when we experience lust or greed or other passions we may repent and struggle against them. But those who call greed and lust good cannot repent. This ideological inversion was propounded by Ayn Rand in the 1940s and 1950s, and spread to the institutions of state and society in the West, especially in the 1980s, until it has now permeated much of society and people’s values as the insidious propaganda for it continues and increases. We may never be able to remove inequalities of wealth; we may never be able to eliminate the gap between the rich and the poor. But we can and ought to resist the ideology that says that it is a good thing, and that the passions that maintain it are to be encouraged. This post is part of the February 2012 Synchroblog – Extreme Economic Inequality | synchroblog in which different bloggers write blog posts on the same theme, and provide a list of the other posts so that people can follow the theme by surfing from one post to another. As I look back on my life I can recall several experiences that could be said to be experiences of the wilderness, some literal, some figurative. I won’t go into all the details of all these now; for the sake of those who might be interested, I’ve linked a couple of them to other posts that give some more details. The first, flight into exile in the UK, was not a real wilderness experience, though it felt like it at the time. I had finished my BA degree at the University of Natal, and was working as a bus driver in Johannesburg to try to raise money for postgraduate study in the UK. I needed to be in the UK at the end of September, but in January a man from the Security Police phoned me and wanted to see me. I thought he was either going to give me a banning order, or confiscate my passport, so I scarpered the same night, driving to Bulawayo and catching a plane to London from there. When I got back two-and-a-half years later they came and confiscated my passport. It wasn’t really exile, but it felt like it because of the sudden and unexpected parting from friends and family and arriving in a strange country with no money and no job. I felt, in a very mild way, what refugees must feel like. The last, churchlessness, was when we left the Anglican Church in 1985, and asked to join the Orthodox Church, which entailed writing a letter to the bishop. The bishop referred the letter to the Pope, who said he must refer it to the Holy Synod, but then died before the Holy Synod could consider it. The Anglican Church sent a lawyer after me, who unfairly and unjustly accused me of stealing church property, and was extremely nasty about it. So we were left in a kind of ecclesiastical wilderness, and at times both Val and I entertained thoughts of going up to the railway line that runs over the road from us and throwing ourselves under a passing train. Neither of us told the other about these thoughts until long afterwards; it was definitely a spiritual wilderness experience. After being deported from Namibia I read a book called The anatomy of exile: a semantic and historical study , and though I can now remember very little of what it said, it made me reflect on the experience of exile, and to realise that what I missed most was not so much places, as people. But in Lent, and especially in the first week of Lent, we are reminded that all our earthly experiences of exile are actually pointers to a larger exile, and the hymns of the church focus on the expulsion of Adam and Eve from Paradise. In Western theology there is the idea of dwelling in the Land of Unlikeness, where we have lost the likeness of God in which we were created. and endured crucifixion unto death. v. (6) If You, O Lord, should mark iniquities, Lord, who could stand? But there is forgiveness with You. The Lord took a handful of dust from the earth. He breathed into it, and created me, a living man. truly I enjoyed the life of the Angels. I ate the forbidden fruit and forfeited the glory of God. O my compassionate Lord, call me back to Eden! v. (5) For Your name’s sake I have waited for You, O Lord, my soul has waited for Your word; my soul has hoped on the Lord. I disobeyed Your command, O Lord. I exchanged the glory of my mortal body for shame and nakedness. The earth is cursed and brings forth thorns and husks for me. call me back and restore me to Eden! v. (4) From the morning watch until night, from the morning watch, let Israel hope on the Lord! v. (3) For with the Lord there is mercy and with Him is plenteous redemption, and He will deliver Israel from all his iniquities. This post is part of a Synchroblog, in which several bloggers post articles on the same general theme. This month’s theme is “Experiences in the Wilderness”, and here are some other blog posts on the theme. A synchroblog is when a group of bloggers wrote about the same general topic on the same day, and post links to each other’s posts, so that people can easily surf from post to post and see the same general topic from different points of view. Please ignore the US-centric blurb, and feel free to write about it even if you don’t live in the USA and don’t want to emigrate there. There is a synchroblog on syncretism this month. Syncretism is mixing up two (or more) religions to make another religion that is different from those that went to make it up. It is not quite the same as borrowing elements from other religions, and nor is it quite the same as what the Russians call dvoeverie — practising two or more religions side-by-side. But actually the synchroblog posts deal with all three. And then there is this post The Deacon’s Bench: Buying into the “Prosperity Gospel”, which seems not unrelated. New Direction has been seeking to foster safe and generous space for authentic conversation about faith and sexuality. We have committed ourselves to building bridges. But we cannot do it alone. We need other Christ-followers: gay and straight and everything in between, to speak up and join the conversation, to share the heart of the gospel in the midst of this conflict. We need those beyond the walls of the church: gay and straight and everything in between, to speak up and join the conversation, to share their thoughts on how the church can reach across the divide and build bridges. See the press release on the event here. Today, 8 March, is International Women’s Day, and it has captured the imagination of a group of Christians, many of them in the USA, enough to inspire them to have a synchroblog to mark the occasion. So people who participated have blogged on women of the Bible, or Christian women in history. Here are links to some of the blog posts that are already up, and you should find more links at the end of each post to follow them. I had never paid much attention to International Women’s Day before, partly because we have a national Women’s Day on 9th August, which is a public holiday. So I looked up Internatonal Women’s Day, and discovered a little about its history. It seems that is very much a socialist festival, and I found it quite interesting that many of the women who are participating in this synchroblog are Americans of evangelical Christian background. According to the news media, American evangelicals are almost synonymous with the “religious right”, and so the very fact of this synchroblog breaks stereotypes, not only about women, but also about the “religious right” and the American aversion to “socialism“. I thought the easiest way to write it was to look up saints commemorated on 8 March, and to blog about any women saints commemorated on that day. It turned out that it was the first Sunday in Lent, the Sunday of Orthodoxy, and so it seemed logical to write about St Theodora the Iconodule, who established the practice of observing the First Sunday of Lent in this way — a shrewd move, because it has probably protected the Orthodox Church from iconoclasm to this day. Both “religion” and “science” are cultural constructs based on Western modernity. By “modernity” I mean the Western worldview (or “paradigm”) shaped by the Renaissance, the Reformation and the Enlightenment. than integrated ways of life. The legacy of this view of “the religions” is the modern problem of conflicting truth claims (Harrison 1990:63-64). The very term “interfaith” is thus a product of this conception, which is in turn a product of Western history — the idea of religions as “faiths”, that is sets of beliefs. Harrison (1990:5-6) also points out that, in the West, there were three different understandings of ‘nature’, which led to three different understandings of ‘religion’ and ‘the religions’. The natural order is opposed to the supernatural. ‘Natural’ religion is the result of human sin and stands in opposition to ‘revealed’ religion. This dichotomy was largely shaped by the Protestant reformers. An instinct, or the light of conscience (also Bacon, and Kant’s ‘practical reason’). This view is derived from Renaissance thought and ultimately from Stoic philosophy. In this view the natural is not opposed to the supernatural but complements it. The light of nature is that which springs from reason, sense, induction and argument (Bacon), which Kant later called ‘pure reason’. It was this view that developed as the Enlightenment progressed, and led to ‘religion’ being investigated in the same way as phenomena of the physical universe. There were such radical changes in religious orientation in post-Reformation England that there was in effect a diachronic religious pluralism, which led to secularization, and “the comparison of the various forms of Christianity with one another, and shaped to a significant extent the way in which the English were to see other ‘religions’. The whole comparative approach to religion was directly related to confessional disputes within Christianity”(Harrison 1990:3). In other words, the frame of reference for the understanding of “religion” has been shaped by the history of Christianity in Western Europe since 1500. To this extent “religion” is a modern Western social and cultural construct. For more on the differences between premodern and modern Western Christianity, see my post on The ikon in an age of neo-tribalism. Like religion, “science” is also a social construct. In English, more than in other languages, “science” has come to refer primarily to the “hard sciences”:, those that use empirical methods of verification, though even in English there is a wider meaning. In premodern times, for example, theology was called “the queen of the sciences”. In that sense, “sciences” meant “branches of knowledge”. And even today non-English speakers sometimes refer to people writing “scientific articles” and reading “scientific papers” on theology, whereas native English speakers would probably say the articles and papers were “academic” or “scholarly”, and reserve “scientific” for the “hard” sciences, like physics, chemistry, botany and zoology. Even social scientists would be thought of as reading academic papers rather than scientific ones. I am particularly conscious of the language difficulty from the time that I worked in the editorial department at the University of South Africa, which was bilingual in Afrikaans and English. It was a distance-education university, and all study material was prepared in both languages. Some subjects, however, were uniquely bound up with Afrikaans culture, and with white Afrikaner nationalism. One such was Fundamental Pedagogics, which claimed to be the science of education. It was not, its proponents claimed, a philosophy of education, because there can be many different philosophies. It was scientific, and there can only be one science, and so from its lofty scientific pedestal it could sit in judgement on all mere philosophies of education. In the original Afrikaans the word was “wetenskap” and “wetenskaplike”, which are usually translated as “science” and “scientific” respectively. It is the equivalent of the German Wissenschaft or the Russian nauka. Though “wetenskap” can also mean knowledge, Afrikaans also has another word, “kennis”, which corresponds more closely to the English term “knowledge”. To English-speaking people, however, or at least to English editors, Fundamental Pedagogics did not seems so much like a science as an ideology, and the fundamental pedagogicians, in their claims for their discipline, seemed to be including it among the natural sciences. One could never be sure whether this was a linguistic or cultural misunderstanding, or whether the fundamental pedagogicians were simply snake oil salesmen. In English, more than in many other languages, “science” has come to be used primarily of the natural sciences. This in itself shows that the term “science” has a meaning that varies from culture to culture. Thomas Kuhn, with his concept of paradigm shifts, emphasised this even more. Both “religion” and “science”, therefore, are cultural constructs, and need to be seen in the context of the culture in which they originated. Can one bring religion and science together, and see how religion sees science or how science sees religion? develop in tandem. For this reason ‘religion’ was constructed essentially along rationalist lines, for it was created in the image of the prevailing rationalist methods of investigation: ‘religion’ was cut to fit the new and much-vaunted scientific method. In this manner, ‘religion’ entered the realm of the intelligible. That brings us back to the question I asked at the beginning. Which religion? Which science? One way in which I saw them brought together was a science fiction story. It introduced me to the concept of scientific paradigm shifts some years before Thomas Kuhn’s book on the subject was published. I’ve sometimes wondered if Kuhn read the story, and whether it perhaps gave him the germ of an idea. Or perhaps both his thesis and the story grew out of the same Zeitgeist. The story was The new reality by Charles L. Harness, first published in 1950 (ie 12 years before Kuhn’s The structure of scientific revolutions ). The story concerns a group of scientist who are investigating a theory that paradigm shifts were not just changes in human consciousness, but that the world itself actually changed each time there was a paradigm shift. When the paradigm was that the sun revolved around the earth, the sun really had revolved around the earth, and when the paradigm changed, the earth began to orbit the sun. To test this thesis, they want to break down the current paradigm, the Einsteinian one, which is based on the speed of light. They construct an apparatus (remember the Large Hadron Collider?) that will let through exactly one photon of light and direct it at a prism set at exactly 45 degrees. When a rat in a laboratory maze is faced with a fork in the path, so that it doesn’t know whether to go left or right, it hesitates. So the photon, on encountering the prism, would hesitate for a split second before deciding whether to reflect or refract. That would slow down the speed of light on which the Einsteinian paradigm is based. The apparatus was constructed, and the machine was switched on. One of the male laboratory staff suddenly found himself naked in a garden. The laboratory and everything in it had vanished. A female colleague, likewise naked, approached him through the trees, offering him an apple. Anderson, Walter Truett. 1990. Reality isn’t what it used to be . San Francisco: Harper. Harness, Charles L. 1998. An ornament to his profession . NESFA Press. Harrison, Peter. 1990. “Religion” and the religions in the English Enlightenment . (Cambridge: Cambridge University Press). Kuhn, Thomas. 1962. The structure of scientific revolutions . This post is part of an interfaith synchroblog on “Religion and science”. K.W. Leslie (Christian/Pentecostal/Assemblies of God) of The Evening of Kent on How I taught science instead of “Christian” science. Matt Stone (evangelical Christian) of Glocal Christianity on Is Evolution Atheistic? Post-modernism: A Challenge to Science?